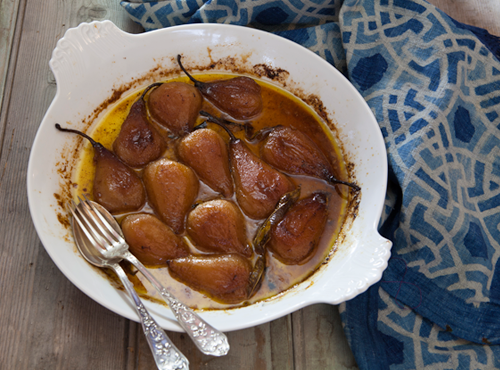 This magnificent dessert, inspired by a similar dish from Savoy region in France, is an exercise in simplicity: pears, butter, sugar, vanilla and very little else. Open your best bottle of dessert wine with this. Preheat oven to 160°C. Choose an ovenproof dish in which the halved pears will fit well with no extra space. Butter dish well and peel, halve and core pears. Put pear halves into dish, hollow-side uppermost. Scatter with castor sugar (1 tablespoon per pear half), then dot with butter. Put vanilla bean pieces into dish, then pour in water. Cover dish tightly with foil and bake for at least 1½ hours. When pears are tender and smell superb, remove foil and spoon 1 teaspoon cream into each pear hollow. Increase oven temperature to 200°C. Return dish, uncovered, to oven for 15 minutes until cream has melted and mingled with buttery juices. Allow to cool a little before serving.